pristine at the top, but gradually seeming to dissolve and decay as you go further down—simply a reminder that nothing, whether material or natural, is eternal. TLOZlink5, you have the makings of a sensitive architect -- creative, thoughtful and curious. Too few architects think theology in their designs, and the spaces are either too austere (spiritual without the messiness of humanity) or they echo a predictable but conformist ecclesiology. I hold hopes that the new Saint Nicholas will wed religious ornamentation with a simplicity of design. La Sagrada Familia is fabulous and monumental. Can something as evocative be created in miniature? Let us pray. . .
Hopefully it will be something BPC and other reactionaries will hate. That may be fine for an art museum, but churches should be more modest. The way Baroque Rome is modest? What I intended, and should have said was, that a church at the site of a national tragedy and memorial to 3,000 dead should be relatively modest. In other settings something Koolhaas-ian might be appropriate, but not here. Interesting story, I have seen the church's web site once last year showing photos of the ornate interior. I have to wonder why bother with having an architect "design" something, just recreate the facade from the existing photos as a guide. "The most precious of the old church's possessions - relics, or tiny bone fragments, of St. Nicholas, St. Catherine and St. Sava - were never recovered. To Archbishop Demetrios, the notion that the saints' relics were intermingled in the dust with the remains of the attack victims only serves to sanctify the site further." I guess what he failed to realize is that ALL of the debris and the dirt, rubble etc right down to the foundation was totally removed and as I remember- hauled over to what was it? "freshkills" landfill (and man if THAT isnt an ironic name for where the debris wound up...) to be sorted and looked over, so whatever relics and Saint bone fragments was there is now in NJ sanctifying the landfill there not the site where the church was. Perhaps I am being too sensitive, but I cannot understand why anyone would hope that a church would be built in a style hated by someone who is a member of the religion to which the church belongs. As a former (infrequent) parishioner of that church, I only hope that the ultimate design will be something Herbert Muschaump will hate. Some unispired post-modern garbage that would appear that the building was built 80 years ago huh...something like BPC. I suppose you would prefer some Gehry-esque eyesore that will be out-of-date and out-of-fashion five years after it is built. That may be fine for an art museum, but churches should be more modest. Actually I would prefer it but it's not necessary. The church can be modern and modest at the same time. It just seemed like you were implying that they should build a little church with a traditional bell tower, fake ornaments, etc., to act as if the church has been there way before 9/11. Why stop there, screw the current plans and recreate the new wtc from existing photos as a guide. How nonsensical right? I don't understand why being a church makes it justifiable to build some copy of outdated architecture. Are churches not supposed to adapt and progress to modern times? It just seemed like you were implying that they should build a little church with a traditional bell tower, fake ornaments, etc., to act as if the church has been there way before 9/11. Fake ornaments? the facade actually was very plain except maybe the shape of the upper parts of the windows I think were pointed and the very top where the bell was reminded me of old Spanish missions. Beyond thatthe facade was devoid of gaudyness. Why stop there, screw the current plans and recreate the new wtc from existing photos as a guide. How nonsensical right? I've wondered that myself, WHY create an entirely whole new everything from scratch when all the original plans for the two towers could have been modified and maybe built them 50 floors or so high, or even the original 110- whatever, there was nothing wrong with the floor space layout. They could have put the two towers back in pretty much as they were with modifications/updates etc as needed and it would have gone a long way towards visually putting back what is missing there instead of making the entire site a constant daily reminder. I don't understand why being a church makes it justifiable to build some copy of outdated architecture. "Outdated" by whose definitions though? that really has become a nonsensical catch term and seems to be used more and more by big corporations brainwashing people into the mindset that they have to replace their "outdated" 2 year old $15,000 cars, their "outdated" hair styles every month, "outdated" clothing styles from gasp!!! LAST year!!! and so on. If you stop and think about that you can see how brainwashed the American public has become into replacing almost everything on an almost annual basis (if it doesnt fall apart first) and certainly by 5 years- from major appliances to houses and everything in between. That's why the landfills are so damned stuffed full of the updated but now outdated in a year junk people keep throwing out! The DesMoines paper ran an article a couple of weeks ago on that with a photo of what people threw out on the annual big item garbage days- perfectly good furniture, sofas, beds, cribs, you name it. People don't bother keeping or repairing anything any more they just toss it and buy new in an endless cycle, and then wonder why their credit cards are $30,000 in the hole. If people always felt that way, there would be no gothic cathedrals, no art deco - well, you get the idea. Shouldn't we have an architectural legacy to pass to the 22nd century? If, at its noblest, architecture is able to elevate the mundane and necessary into that which lifts the human spirit as it serves the public need, then art that is beyond the predictable and expedient should guide the design of St. Nicholas. Ecclesiastical architecture once played a critical role both in how a city projected its importance (temporal power) and its inherent values (spirituality and the social contract). Temples, churches and mosques were gathering places, often surrounded by markets and commerce, and serving as sentinels to remind the community of a power greater than civic authority or tremendous wealth. Such monolithic metaphors no longer speak so convincingly in a diverse, pluralistic society of many creeds, but the need remains for a community to be inspired, to reach for its ideals, and to see life (temporal and eternal) beyond greedy self-interest or cynical hard-heartedness. Even if the new design of St. Nicholas church echoes the shape and simplicity of the former building, the faith community has been forever changed by 9-11 and its aftermath. The architecture must somehow embody not only the evolving physical requirements of the community but also its spiritual aspirations. Because of its location, the new church will be a provocative witness to endurance and a sentinel for hope. If the architect has chosen suitable and effective metaphors, then believers and non-believers alike would be able to find solace in its design. So far, every structure considered for the WTC site has elicited much debate and discussion. It will be no different for this small church. The challenge will be to effect great art in miniature form. Perhaps it will be a modernist Faberge egg to bask in the elegance of Calatrava's transit center, or instead, a Koolhaus orgami. And if perchance the Freedom Tower is inelegant, may the views from it be elevated and inspired by the great architecture that surrounds it. The bone fragments may be among the thousands of unidentified human remains stored in the refrigerated trailers at the NYC Medical Examiners Office. Due to their age the DNA is probably degraded and would be hard to identify, even if other samples from those long-dead saints could be located elsewhere and DNA profiled. There would have been no way the recovery teams at the site or Fresh Kills could have separately identified the saints' bone relics from victim bone fragments, if the container holding the relics was destroyed, which was very likely. At midnight tonight, the parishioners of St. Nicholas Greek Orthodox Church in Lower Manhattan will celebrate Easter where they have worshiped for five years. In Brooklyn. At SS. Constantine and Helen Cathedral. With all the talk of unkept promises at ground zero, it is sometimes easy to overlook St. Nicholas Church, structurally the smallest victim of 9/11, crushed by the collapse of the south tower. But its own journey through the redevelopment wilderness has been no less protracted than better known projects. And it is not over yet. The new site for the church is being dictated in large measure by something entirely unrelated to liturgical or parochial needs: the layout of an underground screening center that would serve as the security conduit for all vehicles entering the ramps, roadways, loading docks and parking areas serving the new trade center buildings. The church must be undergirded by a hardened slab to protect it from an explosion in the ramps below, just as the ramps must be protected from an explosion set off in the church above. "We cannot really proceed, even with planning, I mean architectural planning, because we have to know what's going on," said Archbishop Demetrios, primate of the Greek Orthodox Church in America. "How strong would be this undergirding? And therefore what type of building do you have on top? How high? What's the material? The weight? There are a number of factors here. "We would like to conclude the issue as soon as possible." There is no way to say exactly when the end will come, though it appears to be on the horizon. "What we're attempting to do is balance the church's spiritual needs with design, construction and safety issues," said Steven Plate, the director of priority capital programs at the Port Authority of New York and New Jersey, which will build the screening center at a cost of $478 million. An irregular, 4,500-square-foot site on Liberty Street, facing the World Trade Center memorial, has tentatively been assigned to St. Nicholas, though the exact dimensions are not yet set. It would have a forecourt, which Archbishop Demetrios imagines as a possible permanent home for the steel-beam cross salvaged from 6 World Trade Center. The new St. Nicholas will have a sanctuary and a separate contemplation hall where people of any faith — or none — can come for a spiritual retreat from ground zero. Wrapped around the new church and forecourt, following the curving geometry of the ramps below, would be an elevated park and overlook. The site is almost four times larger than the church's original lot at 155 Cedar Street, which it still owns but will exchange for the new site. Planners for the archdiocese want the new building close to Greenwich Street, rather than behind or on top of the hill that will be formed by the entryway to the ramps. "The church has to be accessible," said Nicholas P. Koutsomitis, an architect who is preparing the master plan for St. Nicholas. "It can't be perched on top of a hill." Stefan Pryor, the president of the Lower Manhattan Development Corporation, said the church would be placed "as close to its desired location on the east as possible," pending approval by the Port Authority and the multi-agency Lower Manhattan Counter-Terrorism Advisory Team, which includes the New York Police Department. The government's interest in accommodating the church, he said, is based not only on the historical presence of St. Nicholas in the neighborhood — once a vital Greek and Syrian quarter — but in its greater symbolic role. "This is the site of an attack that was based on religious extremism," Mr. Pryor said. "By creating an interdenominational center that welcomes people of all faiths we think that the church is making a marvelous statement." St. Nicholas was founded in 1916. Before moving to Cedar Street, its parishioners worshiped in the dining room of a hotel on Morris Street run by Stamatis Kalamarides. His grandson, John E. Pitsikalis, is now president of the parish council. Growing up in the Midwood section of Brooklyn, Mr. Pitsikalis remembers traveling with his family into Manhattan for the midnight service at St. Nicholas on Easter Sundays. "There's a lot of loyalty to your first church," he said. Since the destruction of St. Nicholas, its members have scattered to churches in New York and New Jersey. The largest group wound up at SS. Constantine and Helen in downtown Brooklyn, where their priest, the Rev. John Romas was assigned. "The community of St. Constantine has really embraced us," Mr. Pitsikalis said. "It was like we were refugees." Grateful as they are, however, the people of St. Nicholas long to return home. "I was walking on the street and ran into a parishioner in her 70's," Mr. Pitsikalis said. "She's scared that she might die and not be buried from St. Nicholas." Here, however, because of the tragedy of 9/11, I would prefer not to see too much of an out-there design. Something modest and conservative seems more appropriate. I am Eastern Orthodox Christian, and I consider myself open to abstract and objective thought concerning religion, and I also like many futuristic structures. However, I don't know just how comfortable I would be attending this building as a church. 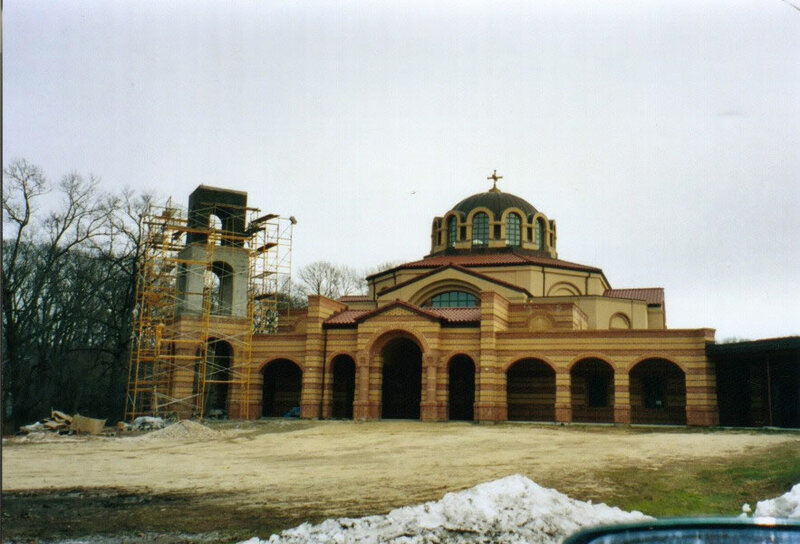 Here's the recently built Greek Orthodox Church of the Assumtion in Port Jefferson, Long Island.... 2005 I think. I'm Roman Catholic, but the rebuilt St. Nick's will be something special for everyone.... I hope. That looks like an Armenian branch of the church. Nope.... Greek. Nice Architecture either way. Last edited by Gotham; December 21st, 2006 at 01:57 PM. Alright, thanks for the clearup. They/we are the same branch anyway, basically. To all who don't know, here's how it happened: Emperor Constantine broke the Roman Empire into two, the West with the capital at Rome and the East Empire with the capital at Byzantium, current Istanbul. Rome gave rise to the Vatican, Catolicism and Protestant branch-offs, while Byzantium gave rise to Eastern christian churches, such as Greek, Armenian, Russian and others.